What is your dream date? My dream date would consist of an entire day of doing fun things like renting jet skis or learning how to surf! Then getting dressed up for a fancy dinner and grab ice cream at Mitchell’s for dessert. I would like to end the night enjoying a horse drawn carriage ride around the city spending time with the person I’m with. What is your dream job? My dream job would be anything that involves dance whether it’s performing, assisting or teaching. What is your biggest fear? Getting into a plane crash. What is one thing most people would be surprised to know about you? I can be a very shy person! What is your biggest accomplishment? My biggest accomplishment is being chosen to represent The Cavalier Girls and the NBA in Beijing, China this past summer! It was such an honor to be one of the dancers chosen to travel across the country. Me and my other teammates chosen had such an amazing experience and had so much fun exploring a different culture and performing for our fans halfway across the world! What is a failure you learned from? When I auditioned for other dance jobs prior to being a Cavalier Girl and not being chosen for the position. Sometimes I take it extremely hard when I should be focusing on the next task. One door closes, another one opens! What famous person (dead or alive) would you like to have dinner with? Why? I would have dinner with Oprah Winfrey. She is such a genuine person and grew up appreciating everything she has and became one of the most successful women today given how she grew up. Her story is so inspiring to me! What is your guilty pleasure? Eating ice cream while watching movies on my day off. I am most proud of: All my accomplishments so far. 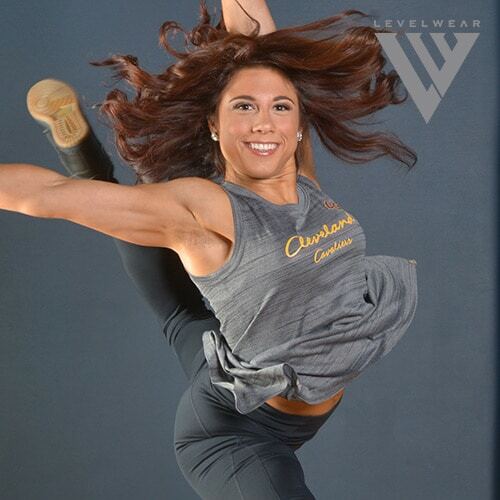 Especially returning for my 3rd season as a Cavalier Girl Veteran! I’ve always wanted to: Travel the world! What is your dance background and experience? I have been dancing for the past 17 years, 14 years competitively and have been trained in Jazz, Tap, Ballet, Contemporary, Heels, Musical Theater and Gymnastics. Why did you decide to audition for Cavalier Girls? I decided to audition to continue doing what I love and being able to dance and perform for anyone and everyone! I love to entertain! What do you like most about being a part of Cavalier Girls? Being able to perform and grow as a dancer and person. Also, the experiences I’ve had so far with everyone on my team, getting opportunities to travel, and be involved with our community. Most memorable Cavalier Girl moment so far? Dancing at the 2016 Finals watch party at The Q Arena and making history becoming NBA Champions for the first time! I can’t even begin to describe the feeling my teammates and I had when the final buzzer went off. The energy around us was extraordinary and so surreal. This is a memory I will never forget. If you can say anything to Cavalier fans, what would you say? Thank for being the best fans in the NBA!